Far-reaching financial regulatory reform is bringing many changes to banking laws and regulations. Practitioners in a broad array of practice areas must stay current with developments both small and large, expected and unexpected. The publisher of the respected Red Box® series, including Securities Act Handbook and Rules and Regulations of the Securities Exchange Commission also offers a single, three-volume, up-to-date reference for banking laws and regulations across all major agencies. 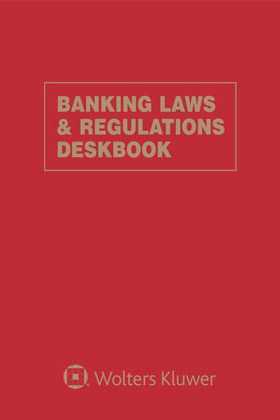 Banking Laws & Regulations Deskbook provides a truly unique combination of comprehensiveness, immediacy, and familiarity. It is the only current, fast-access deskbook covering the full spectrum of financial regulations. The monthly update service keeps you completely current with ongoing changes.